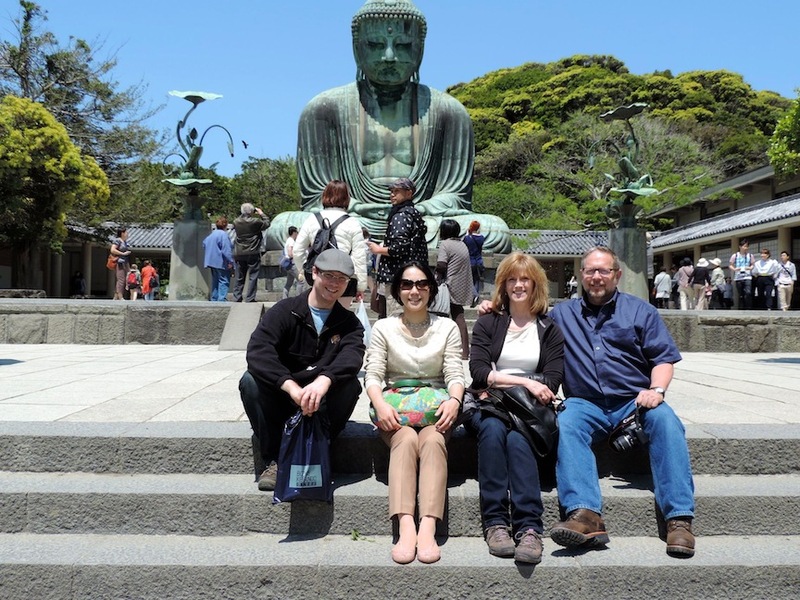 Just chillin’ in front of the Daibutsu in Kamakura. Last week marked the one year anniversary since Lisa and I moved to Tokyo. The level of adaptation I have reached was no more evident than what occurred during two incidents at Narita Airport. My folks had come to visit from Iowa and were headed home after a five day visit. Standing on the remnants of the Edo Castle outside the current Imperial Palace, overlooking Hibiya. My father had had his fill of sushi, seaweed and tofu and was craving for a Big Mac. “It’s been so long since I’ve had meat,” he said. Of course, my mother pointed out that we ate beef or pork everyday during the trip, it was just embedded in vegetable and soup dishes such as ramen, okonomiyaki or curry. “That’s not the same,” said Dad. I will admit, during my first visit to Tokyo some seven years ago I also visited McDonald’s, but only to try the teriyaki burger (verdict: it tastes like a hamburger smothered in teriyaki sauce). Back to the topic at hand. My parents were standing outside the Tokyo airport McDonald’s looking at the sign when a group of Japanese teenagers approached them, asking Mom and Dad to join them for a group photo. 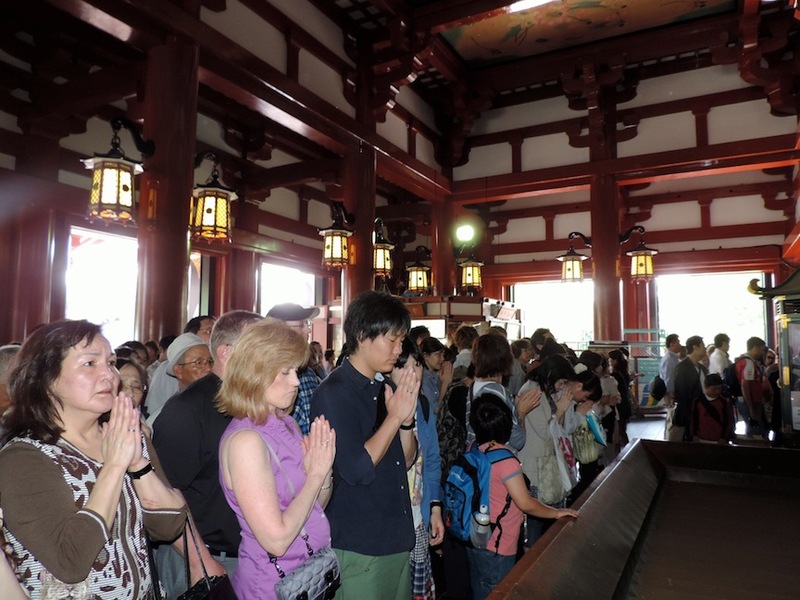 This is a rather common occurrence for foreigners visiting Asian lands, and I was somehow able to act as the interpreter. Mom making a prayer at Senso-ji Shrine in Asakusa. The translation was a little rough, but the photo was accomplished. The second proof of assimilation arose while my father attempted to order his Big Mac meal. I was able to intervene in Japanese before Dad accidentally bought a second large fry. One year ago it would have been me, weaving confoundedly through the dining area with a tray in my hands, wondering why I had so many french fries. Now before I dig too deep into reflection mode, let’s finish up where we left off from last week’s vacation diary covering every detail of my parents’ visit. We left off at Tokyo’s bemused attempt to throw a Cinco de Mayo Festival, including Drug-on Tacos, Buffaro Wings and Japanese girls dressed skimpily as lucha libre wrestlers. Mom and Dad and Hachiko. From there we headed to Shibuya, one of Tokyo’s famed entertainment districts, a neighborhood teeming with high school and college kids just hanging out. Everywhere we stopped in Shibuya was brief, mainly because the masses were a living organism, shifting, surging, propelling. You had to keep your feet moving or else get lost in a sea of aimless teenagers. While this was probably the least likely place to be enjoyed by a couple of middle-aged Midwesterners, Shibuya is a must-see for Tokyo tourists. 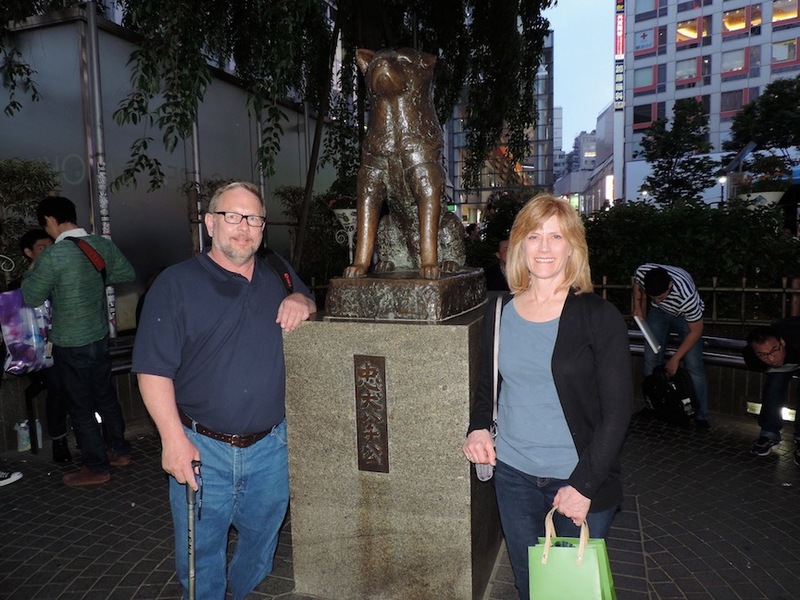 We took a photo op at the renown Hachiko statue outside Shibuya Station. Hachiko was an akita dog who in the 1930s waited for his master at the train station everyday, even years after his owner’s death. Hachiko is memorialized with a statue in the same spot he waited everyday, and today it is a popular meeting point. From there we we did some shopping in the kooky boutiques, including my parents’ favorite: Freak’s Store. Despite the name, the fare sold at Freak’s Store was actually rather tame and pedestrian. Next we stopped by Hikarie 8, the eighth floor of a brand new building (a very rare thing due to space limitations and outrageous land values) devoted to art and culture. 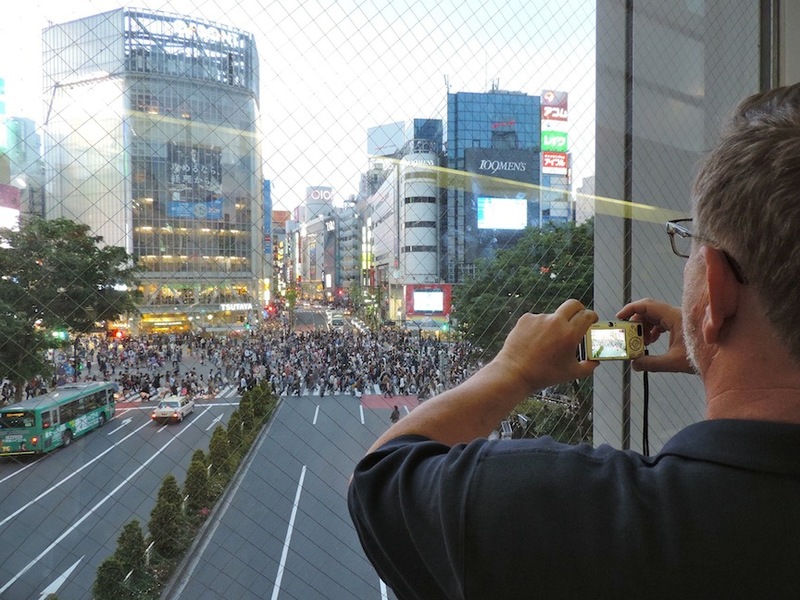 Finally, we found a spot by a window in a station walkway to watch Shibuya Crossing. If there is one image that defines Tokyo, and that is familiar to most foreigners, it is Shibuya Crossing, known as the busiest intersection in the world. Hundreds of people cross the intersection at the same time. The pedestrians patiently wait on the sidewalk for traffic to stop, the crowd slowly building up. Once the green “walk” light brightens up, the pedestrians scramble across the street in one flowing wave. It is a sight you can only witness in Shibuya, and upon observation serves as a microcosm of Japanese herd behavior. My parents were mesmerized. At the end of the day, we had dinner at our favorite sushi restaurant in Mark City, a shopping section of Shibuya Station. The sushi there is reasonably priced and delectable. 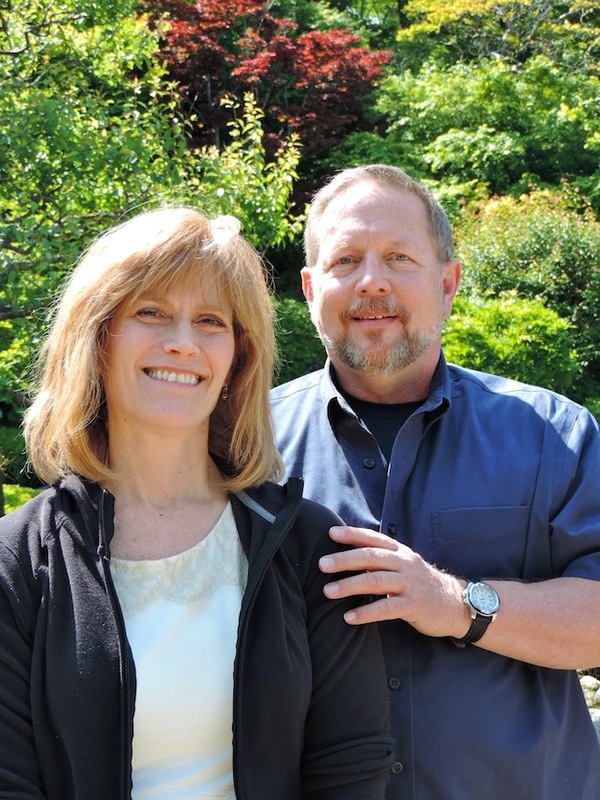 We were happy to see that my parents were able to eat every morsel that was placed in front of them. However, by the end of the meal we were getting rather tired and the chopsticks were getting heavier and heavier, and their fingers more clumsy. During the rest of my parents’ visit, we took it relatively easy on them. Sunday morning, day 3, Lisa and I made brunch at our house and invited Lisa’s brother Yuichi and his family. He and his wife Mika brought along their two sons, Takuto, 17 months, and Hiroto, 5 months. My parents were delighted to play with babies, and their grandparenting instincts kicked in. They were able to entertain and canoodle with any baby despite the language and cultural barriers. After brunch the four of us bid goodbye to Yuichi and his family and we headed for downtown Tokyo. Our first stop was the Imperial Palace, the home of Japan’s Emperor Akihito. The Japanese emperor is the only remaining monarch in the world to use the title of “emperor” and is the oldest continuing hereditary monarchy in the world, dating back to 660 B.C. To tour the inner grounds you need to make reservations three months in advance, which we didn’t do, so we just strolled through the outer gardens of the palace, which were still beautiful. 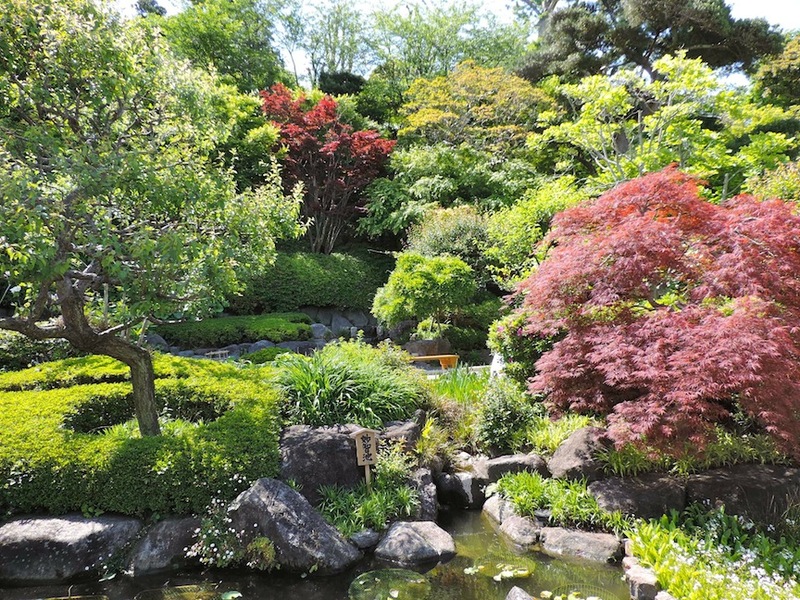 I like to say that the Japanese are the best gardeners in the world, and Japan’s best gardeners work at the Imperial Palace. It was still a little early in the year for the azaleas to be in full bloom, but the gardens’ grasses and shrubbery were still delicately manicured. 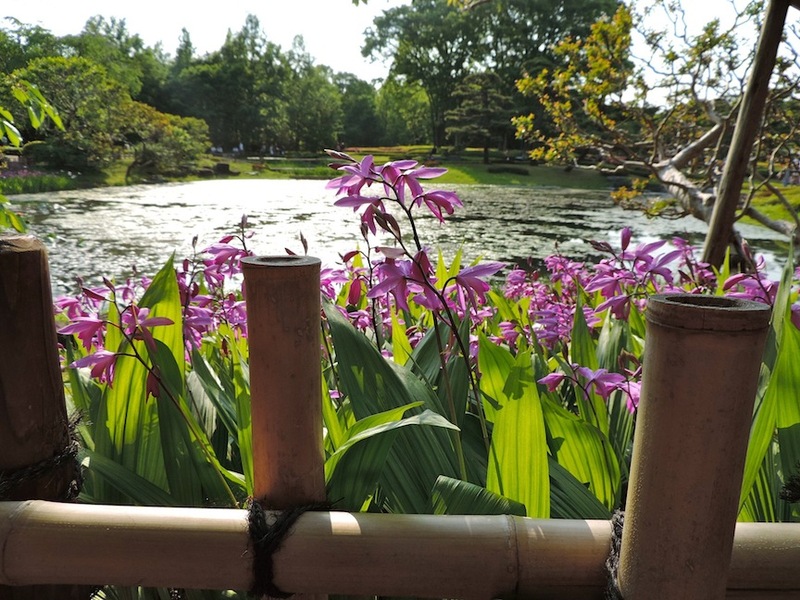 Every time you stopped to take in the scenery it was like you were looking at an ukiyo-e print. We continued our walk to Tokyo Station, another icon of Tokyo. The station, built in 1914, has a brick facade imitated from European design and re-opened last year after a complete renovation. 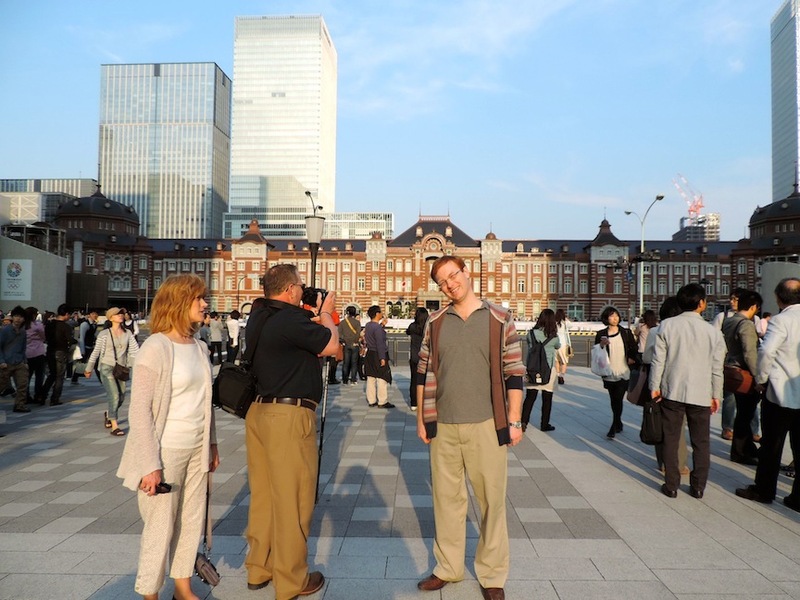 A natural family pose in front of Tokyo Station. Next we hopped in a cab and took a short ride to Ginza, Tokyo’s high-end fashion district. While my folks aren’t necessarily into high-end fashion, we did want to show them Sukiyabashi Crossing, another famous intersection. While not as busy as Shibuya, the crossing in Ginza once upon a time featured the headquarters of Tokyo’s most illustrious technology companies, including Fujiya, Ricoh and Sony. The four-story Sony showroom remains, and open to the public for free, it is still a must-visit for every Tokyo tourist. During my first visit to the Sony showroom about five years ago, I remember they were introducing a laptop that could fit in your back pocket. For some reason it never took off. If it was me, I probably would have sat on the damn thing at some point. On this trip, their top-of-the-line mini camcorders were quite fascinating, as were there egg-sized audio speakers. From Ginza, we hopped back on the train and after a few minutes were in front of Lisa’s office building for a photo op. We grabbed a quick snack of takoyaki (fried octopus balls, one of my parents’ favorites) and highbarrus (whiskey sours). We then took the train to Shimokitazawa, a trendy neighborhood close by our home, where we met another ex-pat Iowan for dinner at a traditional izakaya. Monday morning was more laid back. 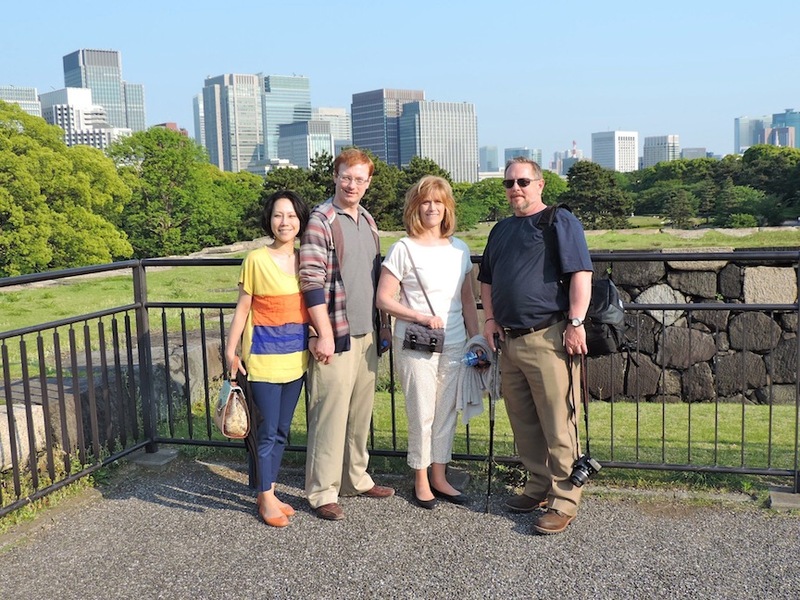 We had been pushing Mom and Dad pretty hard to make sure they got to see the main tourist attractions of Tokyo. You don’t realize how much walking you have to do in this city, as well as the ridiculous amount of stairs there are in the train stations, until you start dragging a couple 60-year-olds up and down and around the city. 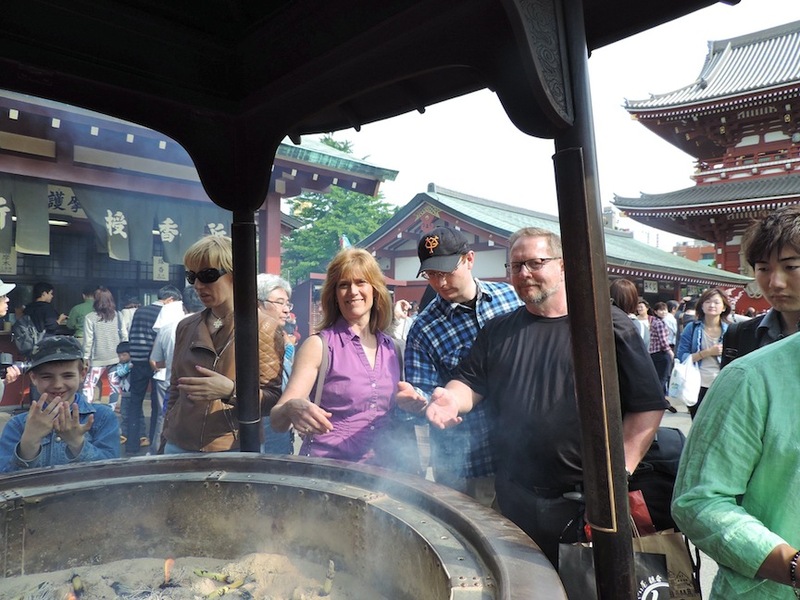 Mom and Dad washing themselves with incense at Senso-ji Shrine. 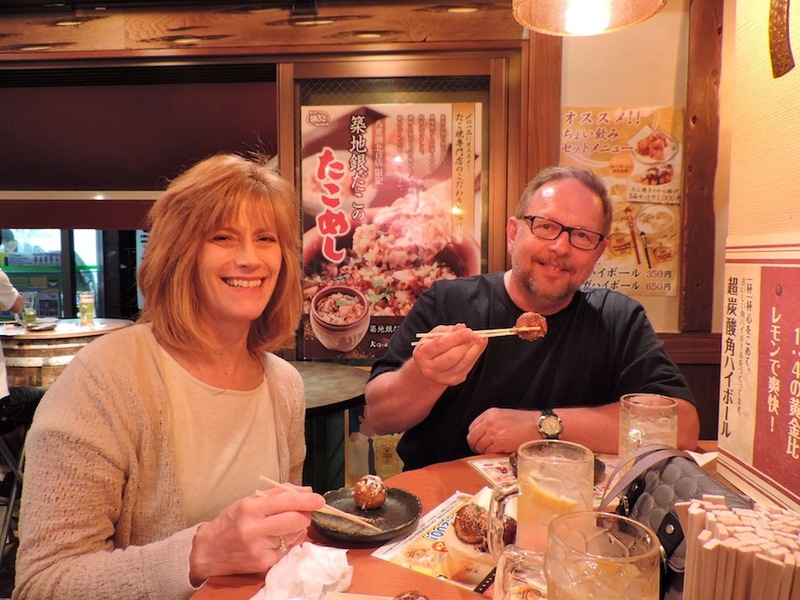 We decided that by Monday we should probably let Mom and Dad actually enjoy their vacation, so after a light brunch at home we took them to Asakusa, which was the downtown entertainment district of Tokyo prior to World War II. Asakusa is the site of Tokyo’s oldest temple, Senso-ji. The pedestrian area leading to the shrine is lined with tons of souvenir shops, so Mom and Dad were able to buy all of the typical Japanese trinkets for friends and relatives back home. After a visit to the temple, we stopped by our favorite okonomiyaki restaurant for a late lunch. Okonomiyaki is usually described as a Japanese pancake. The batter is flavored with fish oil, and mixed with cabbage, ginger and your choice of meat including pork, shrimp or octopus. We ordered a beef okonomiyaki for Dad. The restaurant we prefer was once the favorite spot of some of Tokyo’s famous actors and writers from days of yore. 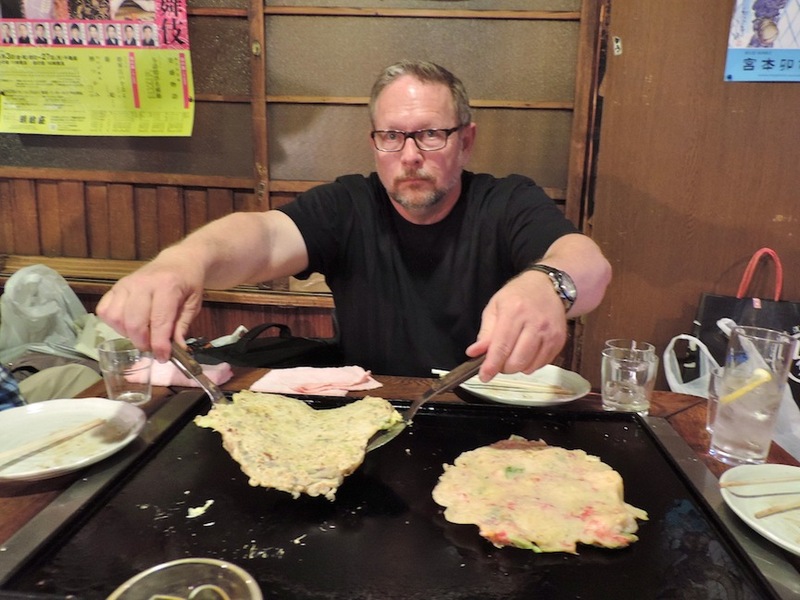 You have to sit on the floor on tatami mats around a large cast-iron griddle, and fry the okonomiyaki yourselves. After a couple beers and highbarrus we were quite relaxed. But it was time to keep moving because we had tickets for the Tokyo Giants baseball game. A friend once admitted that Japan does baseball games better than America. While that is up for debate, it is definitely a unique experience. The atmosphere of a Japanese baseball game can best be compared to a college football game. Our view of the Tokyo Dome. Fans from both teams are well represented, decked out in full team regalia and waving sticks and banners. The game we attended pitted the Giants (the Yankees of Japan) against their biggest rivals, the Osaka Tigers (I guess they can be compared to the Red Sox in order to complete the analogy). 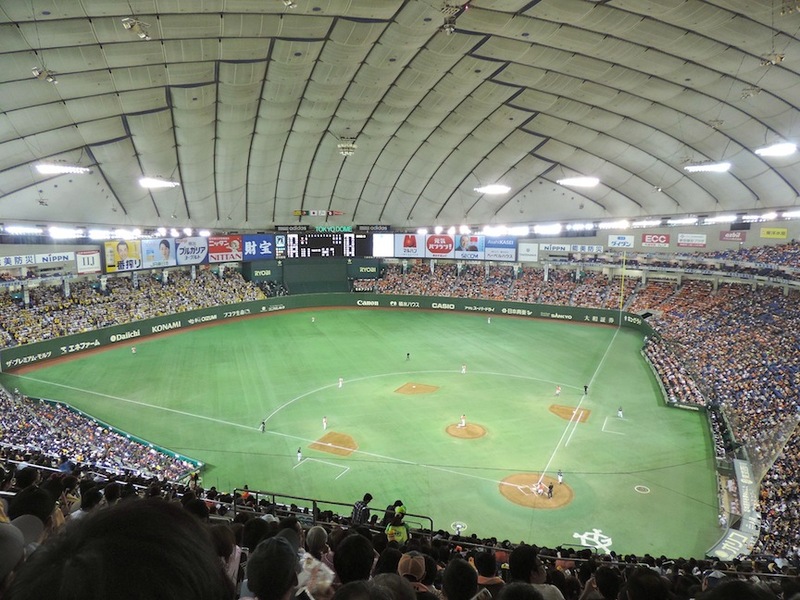 The number of Tigers fans in the Tokyo Dome equalled the Giants fans, and they were much more boisterous, or if you ask my mother, obnoxious. They had a unique song that they sang for every batter, and they chanted non-stop at sonic levels for the entire game. It was quite the experience, but we started to wear down from the constant barrage of overzealous fan support by the fifth inning. The Giants lost 5-2. 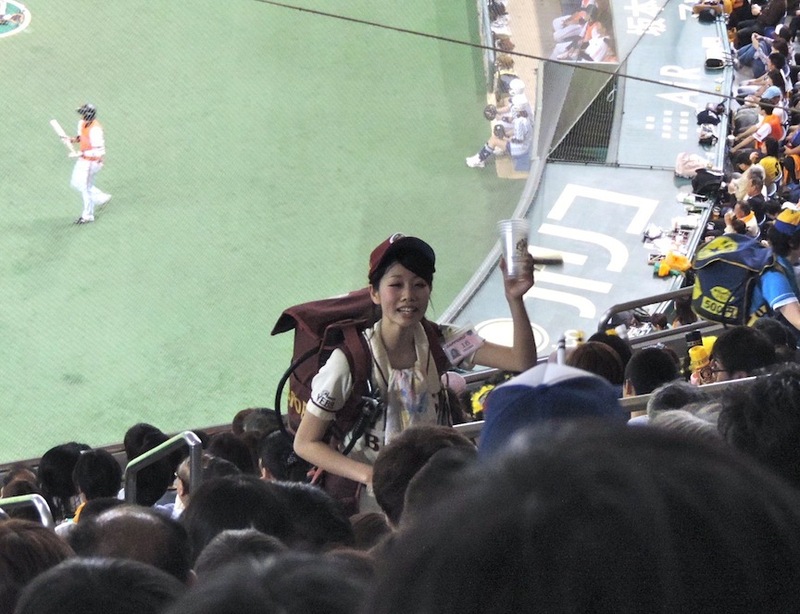 One important point that I would like to add is that inside the Tokyo Dome, young, lithe beer girls continuously trekked up and down the steps carrying mini-kegs on their backs, ready to serve thirsty patrons. The beer costs $8 a cup. After the game we stopped by a yakiniku restaurant near our home for a late night snack. Yakiniku is a restaurant where a small hibachi-style grill sits in the middle of the table, and the server brings you plates filled with small slabs of raw meat. You then grill the meat yourself and dip it into different sauces. We wanted to make sure Dad had enough meat during his stay. The view of the Pacific Ocean from Hasedera Shrine. 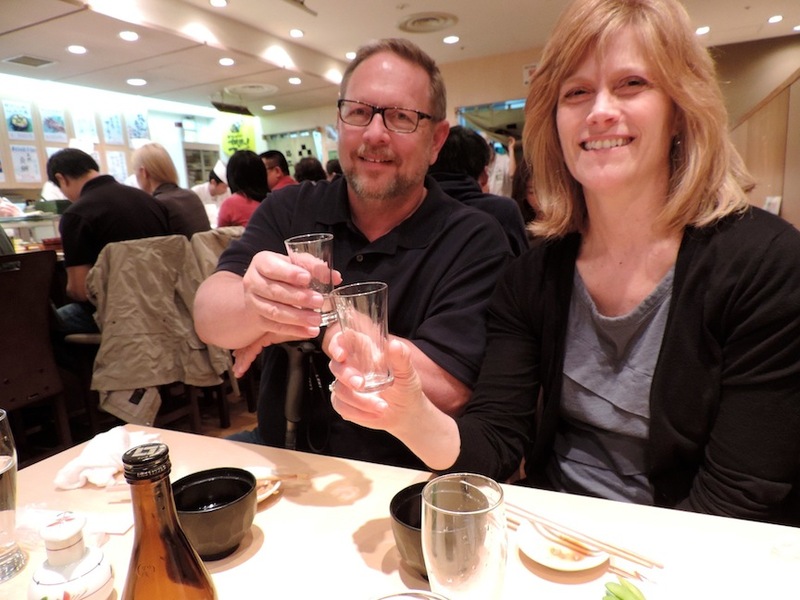 Tuesday was Mom and Dad’s last full day in Japan. 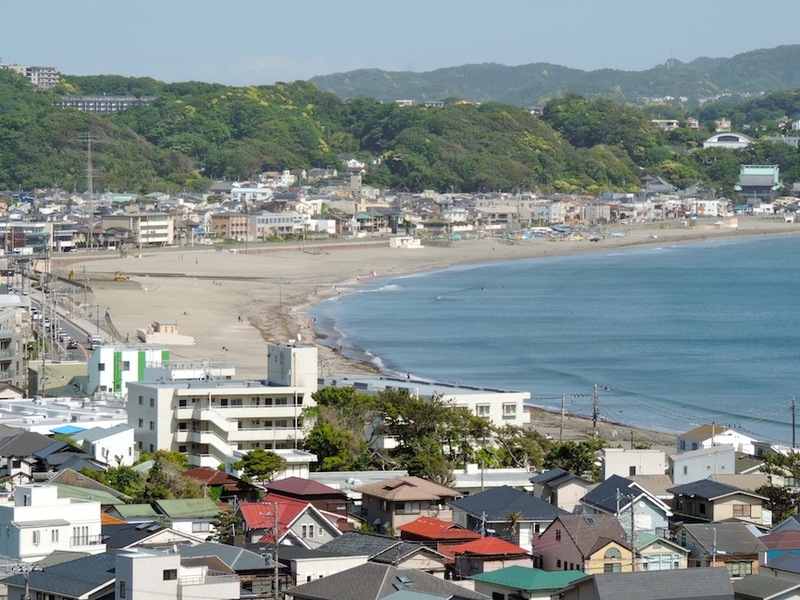 We decided it was time to get out of the hustle and bustle of Tokyo, so we took them to Kamakura, a historic city an hour train-ride away. When the shogunate wrested control of Japan from the emperor in 1192, they moved the capitol of Japan from Kyoto to Kamakura. The Kamakura era ended in 1333 with a bloody battle, and after a short period of imperial rule, Japan entered an era of constant civil war. 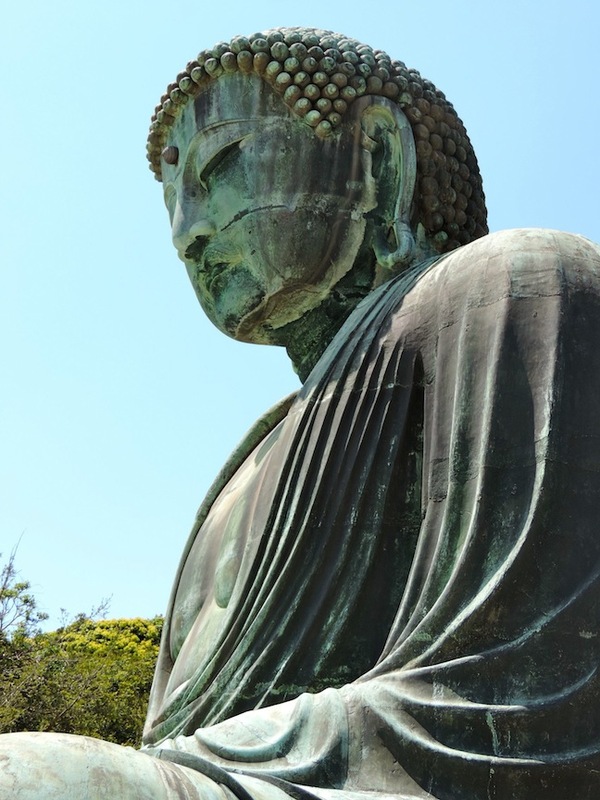 Amida Buddha statue at the Kotoku-in Temple. This bronze statue, turned green after centuries of wear and tear, was built in 1252 and withstood earthquakes, tsunamis and endless battles. It is another icon of Japan and is quite awe-inspiring. From there we walked up another horrendous staircase to visit the gorgeous Hasedera Temple, founded in 686. In addition to the numerous statues, intricate ornamentation and ancient artifacts, the Buddhist temple featured a scenic view of the Pacific Ocean. After enough walking, we took the train to the beach, and sat on the steps and stared at the ocean in peaceful contemplation. We were quite a ways from Iowa. A garden in Hasedera Shrine. We headed back to Tokyo and for our last dinner Lisa made nabe soup. We also stopped by the grocery store on last time so Dad could buy some ramen noodles and curry to take back home. The next day Lisa had to return to work and I guided Mom and Dad to the airport. Tokyo can be overwhelming for visitors, especially people who aren’t used to international travel. While it is a modern city, most locals don’t speak English, directions are confusing and the food can be, well, strange. Mom and Dad did promise to return, but Dad said he would like to rent a cabin in the woods somewhere. I didn’t have the heart to tell him there really aren’t any options like that, but there are still so many wondrous sites to be seen. Thank you for visiting, Mom and Dad! Come back again soon!